Eight persons J, K, L, M, N, O, P and Q are sitting in a square table in such a way that four of them are sitting at four corners and four of them are middle of the sides. The persons who are sitting at corners facing away from the centre and the persons are sitting at middle of the sides are facing towards the centre. 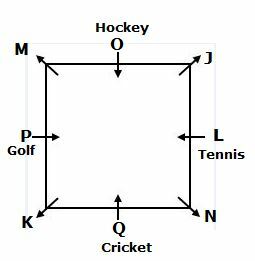 The persons who are sitting at middle of the sides like different games viz., Tennis, Golf, Cricket and Hockey. N sits third to the left of the one who likes Hockey. Only one person sits between N and K. The one who likes Tennis sits third to the right of M. The one who likes Tennis is not an immediate neighbour of K.J sits third to the right of Q. J does not like any of the games. More than one persons sit between O and the one who likes Cricket. O is not an immediate neighbour of N.L is not an immediate neighbour of M.
1. Who among the following sits second to the left of L? N sits third to the left of the one who likes Hockey. Only one person sits between N and K.
The one who likes Tennis sits third to the right of M. The one who likes Tennis is not an immediate neighbour of K.
J sits third to the right of Q. J does not like any of the games. More than one personsit between O and the one who likes Cricket. O is not an immediate neighbour of N. L is not an immediate neighbour of M.
2. How many persons are sitting between K and J, when counted from right of K? 5. If all the persons are made to sit as per the alphabetical order from J in clockwise direction, then who among the following person likes Cricket? Eight persons B, C, D, J, K, S and V are in a family of three generations and with only three married couples. S is the only son of B. K is the brother-in-law of S. C is the daughter-in-law of D, who is the wife of B. C does not has any siblings. V is the nephew of J and T is the daughter of J. 6. How is T related to D? 7. How many female members in the family? 8. If V is married to X, then how is X related to C? Point M is 4m to the east of point J. Point T is 5m to the south of point M. Point Q is 8m to the west of point T and 2m to the north of point B. Point C is 3m to the east of point B. Point N is 10m to the north of point C and 5m to the west of point X. 9. What is the distance and the direction of point X with respect to point T? 1) Who among the following sits second to the left of L? 2) How many persons are sitting between K and J, when counted from right of K? 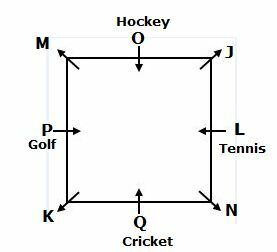 5) If all the persons are made to sit as per the alphabetical order from J in clockwise direction, then who among the following person likes Cricket? 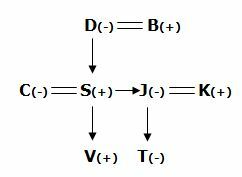 6) How is T related to D? 7) How many female members in the family? 8) If V is married to X, then how is X related to C? 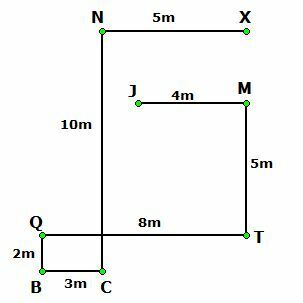 9) What is the distance and the direction of point X with respect to point T?